We asked 53 marketing experts their opinion on word of mouth marketing. We wanted to find out how they get word of mouth referrals to occur and how they track their results. Here’s what they had to say. We talk about word of mouth marketing a lot here at Referral Rock. In fact, it’s one of the main reasons behind our business. So we thought it was time to expand our knowledge of it a little more. If you poke around the web, you’ll find a ton of studies and articles written about word of mouth marketing. A lot of what’s been said has been said at nauseum. It seems like everyone is quoting the same articles and studies. The push of this information could be because it’s true, the value of word of mouth is huge. It plays a big role in a lot of marketing tactics because it works. But we swanted to see if we could find out anything new, as well as get the opinions and first-hand experience from other marketers. So we created a survey to see what other marketers thought about word of mouth. We wanted to find out how they get word of mouth to occur, how they track it, and how effective it is for them in bringing in leads. We asked four quantitative questions that we could compare. One of which was a broken down into a three-question rating scale. And the last question was open-ended. Let’s get on to our findings and see if word of mouth is actually difficult to measure. How is word of mouth typically measured? Before we dive into the ways marketers typically measure, remember that some responses are a simple guess and may be more generalized. With that being said, there are a variety of ways word of mouth can be measured, like some of our data-driven word of mouth examples. In this survey, we provided three of the most common options to choose from. Respondents had to choose between ask customers, track digitally, and just guess. 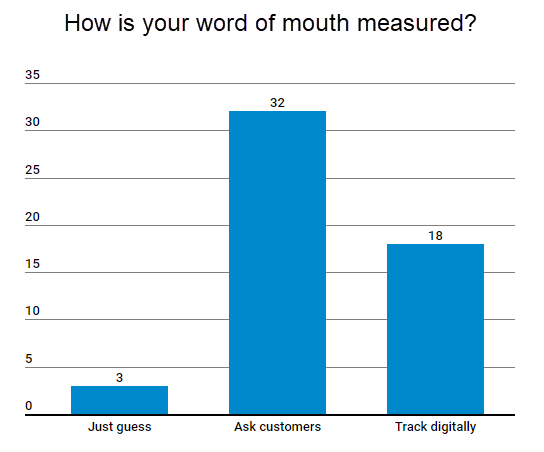 So, how to measure word of mouth marketing? 60% of marketers track their word of mouth referrals by simply asking how they found out about their business. Tracking digitally came in a solid second,18 people said they track digitally. Only 3 people said they just guess. There are many tools out there, that help make tracking a little more efficient. The trick is finding the right tool for your business. Whether that means using an in-depth CRM or using referral software to track your word of mouth. “Word-of-mouth referrals tend to be hard to track because most CRMs don’t make it easy to track referrals, let alone referral revenue.” Says Reuben Swartz from Mimiran. Why is word of mouth difficult to track? Tracking word of mouth can be confusing, especially depending on the way your team chooses to track. “This is less of an issue for companies who don’t do a lot of heavy marketing or advertising. Small companies like contractors or bakers or the like may rely solely on word of mouth because they always have a queue of customers waiting. They’ll still run into the issue of not knowing exactly who was responsible for the referral, though”. By simply asking where the lead came from, you can track your word of mouth. “Word of mouth marketing is hard to track because of the nature of the channel.” Says Steve Kurniawan from Nine Peaks Media. He gave some great ideas on how to measure it. “For example, you can monitor conversations on social media channels, you can analyze search queries used by your audience. Arguably, however, the best way to measure this is to run a survey or interview asking ‘where have you learned about us?’”. Even though it seems word of mouth can be difficult to track, the results point out that it’s well worth it. As you’ll see it produces high quality and fast closing leads. 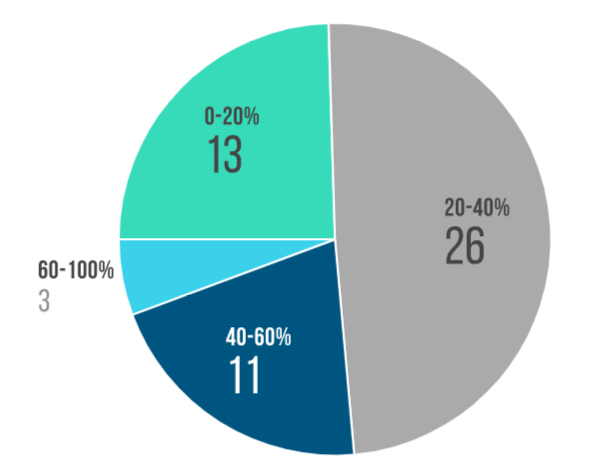 When we look at all 53 marketers combined, it’s clear to see we found that just under half of all respondents believe 20-40% of their referrals come from word of mouth marketing. 49% of marketers believe that 20-40% of their leads come from referrals. We wanted to take a deeper look at these findings. Do B2B and B2C businesses feel the same about word of mouth. Or does one type find word of mouth to be less or more rewarding? For this survey, we had 29 B2B respondents and 24 B2C respondents. Here’s what we found. Comparison of B2B vs B2C marketer’s responses on what percent of leads they get from word of mouth. As you can see, B2C respondents felt that they receive fewer leads from word of mouth. More than half B2C marketers believe they get 40% or less of their leads from word of mouth. 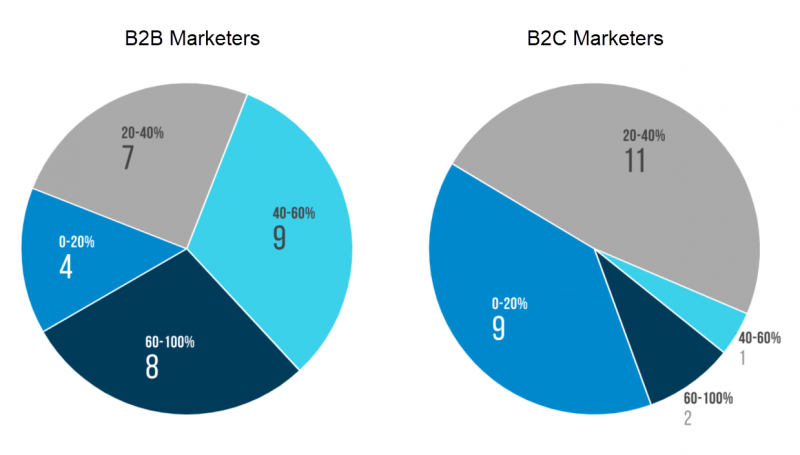 Whereas, B2B marketers believed 40% or more of their leads come from word of mouth. Our survey asked 3 questions based on a 5 point scale system, with 5 being the highest. We rated likeness to close, time to close and lead quality. As you can see the averages from each rating scale favor word of mouth referrals. We averaged all the responses and found that the leads closing rate, closing speed, and quality are all rated well on a 5 point scale. The average rating for the likeliness of a word of mouth referral to close was 3.92. The average rated closing speed of a wom lead was 3.79. Most surprisingly, the average for the quality of this type of customer was 4.28 on the 5 point scale. We are happy that our findings further support other studies. We guess the famous Nielson study was right, referrals are influential and make for a great form of advertising. The last piece of information we asked related to word of mouth promotion methods. 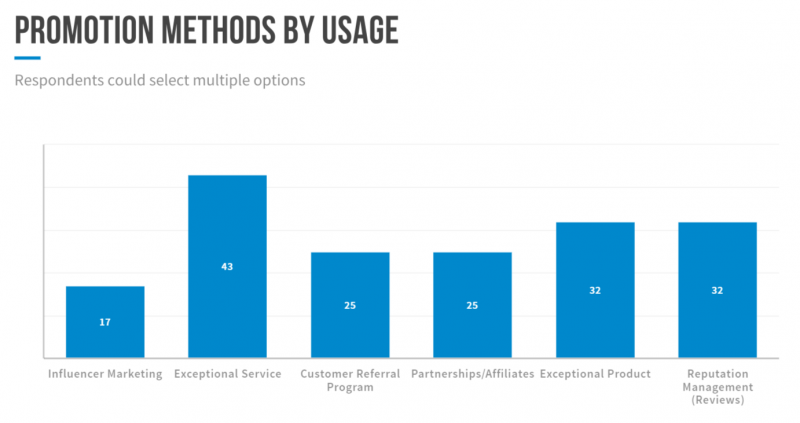 Respondents answered the question, “What ways do you try to promote word of mouth referrals?”, to which they were able to select multiple options from a list. 43 of 53 marketers believe the best way to promote word of mouth referrals is by offering exceptional service. We found that influencer marketing was the least used method among marketers. And that referral programs and partnerships/affiliates were a solid tie both having been chosen by 47% of respondents even though both of these types of program rely heavily on word of mouth to occur. What we found to be most interesting is that 81% said that exceptional service was their method for promoting of mouth to happen. While only 60% of marketers said an exceptional product was a great promotion method. Meaning customer service really does play a vital role in word of mouth marketing. And it further backs up the various studies on customer service, that state people want the whole experience, not just a good product. Zendesk, for example, found that customers switch brands or services because a competitor offers better customer support. Our experts gave us a ton of advice. We have broken it down into 15 subcategories to help you digest it easily. If you want to skip ahead, feel free. Joel Lee from Trumpia, explains that you have to establish a great company for word of mouth to happen. “Your company is not going to be talked about if it is not popular in its field”. He emphasizes that “Creating a successful online marketing strategy is also key in people being exposed to your brand, which can then lead them to talk about it with their peers. From here, word of mouth becomes a domino effect”. “Advise your new clients from the start about your referral program”, explains Alistair Dodds from Smoking Chili Media. “By conditioning them from the start of your relationship of the referral deals you offer, you are giving them food for thought as to the businesses they can potentially introduce you to in return for a retainer discount deal or bonus work you are willing to do”. She then explains how a reward isn’t always necessary. “It’s not always necessary to provide referral incentives, for example, if you’re a dentist looking for more patients – if your work is good, honest, and prices are fair, you’ll be referred naturally in conversation, however, for products or bigger businesses, providing an incentive to customers who refer their friends and family will help the business grow”. Morning Score’s, Marina Dolcic says “We start off with exceptional customer service and communication. The more interaction (and positive interaction at that) you have with your customers, the more engaged they will become with your brand, service or product. This will, in turn, create a loyal customer that will help you in your WOM campaigns”. She also mentions that you need to take charge of all opportunities. “Make sure you use every opportunity to communicate with your customer” and to “Offer help and be honest when dealing with complaints. This is extremely important for your potential customers”. Marina states that “Anyone can receive (or even fake) positive reviews. What potential customers are concerned with is how you solve problems”. Laura Simis from CoalMarch, states “The most important focus area for us is offering the best services possible. We want to be so good, people can’t afford NOT to let us help them”. She brings up a good point that this is especially true when there are a ton of options like yours. “Having happy clients who see the value in what we bring to the table naturally lends itself to spreading the word”. Pawan Kiraula from Digital Acharya, says “There are numerous effective ways that you can employ to get more word of mouth referrals”. Pawan mentions “One of the simplest ways is to provide the best services and experiences to your customers”. Saying that “If your customers are happy with your services then they will be tempted to share good word of mouth about your services naturally”. Nellie Akalp, from Corpnet, mentions “A great way to increase your word-of-mouth referrals is to give the best possible customer service you can”. She mentions that going above and beyond sets you apart, “When you go above and beyond for your clients as we do, it helps set you apart from your competitors who may cut corners”. Her final advice is to remember that customers will know if you cut corners, “So remember when you want to cut a corner by outsourcing, it may hurt you in the long run. Try to keep your service hands-on from your core team to impress clients and bring in those word-of-mouth referrals”. Siddharth Sharma of Clever Tap believes in two things when it comes to word of mouth. 1. Provide a great product – Without this, word of mouth will fail. 2. Exceptional Service – No one remembers a transactional service. They remember great or bad service”. Siddharth then mentions, “As unmeasurable as it sounds, word of mouth becomes a huge force for a lot of business”. “The most effective way of getting more word of mouth referrals is simple – ask for them”, says Elijah Masek-Kelly from Powerful Outreach. Elijah explains “Clients don’t always think about making referrals, so if you make an effort to mention it and emphasize the value of a referral when speaking with clients, it can go a long way to reminding clients that the best way to pay someone back for exceptional service is to recommend that company to their network”. Wise Team’s, Zygimantas Jacikevicius says, “If you are a small business the best way to get word of mouth referrals is to provide great service and stay in touch with your current clients”. He mentions that you can simply “ask around if they could recommend your product or service to other businesses they know”. “Ask happy customers if they know of anyone else who would like your service”, mentions Stacy Caprio from Accelerated Growth Marketing. She explains, “I have found having a clear value proposition that you talk about with everyone who asks what you do can lead to word of mouth leads from non-customers and customers alike”. If you’re wondering how she gets creates happy customers to refer, she says “Customers are most likely to refer you when you get them great results”. Natalie Athanasiadis at Ormi Media says “The most simple method, especially in B2B service-based businesses, is to deliver exceptional service and then just to ask. It’s all in the wording, don’t ask if they can refer anyone to you, rather ask who they can introduce you to who could use your services”. To sweeten the deal even more “Afterwards give your client something to show your appreciation, my clients love that we offer them additional complimentary services to say thank you”, she adds. Roman Daneghyan from Renderforest explains that an ask doesn’t have to be direct. He says, “The most effective way in our experience is to think of ways for making our customers to share your product or service without directly asking them about it”. He shares that because they are an online video creation platform, they have a great way for indirectly asking. “As we have an online video creation platform, we’ve added simple buttons for sharing their created videos on Facebook and YouTube, and the results were really amazing. As they were sharing the videos with their friends, we were getting lots of traffic from there”. Following up with customers and referrals is imperative to a building a relationship. As Victor Clarke from Clarke, Inc. mentions, “Follow up on every referral you receive and provide feedback if it was a good or bad referral”. You can follow up with referrals to learn more about the types of business you’re being referred. And you can follow up with referrals just to say ‘thanks’. Regardless of your reasons, following up is necessary for building your word of mouth. In fact, Joe Goldstein operations manager and lead SEO for Contractor Calls, mentions that “Wowing your clients, developing first name relationships with them, and letting them know that you’re accepting more clients can go far”. And he also mentions that “When your clients like their results and want to help their friends out too, sometimes all it takes is a reminder that you’re still open to new business”. Max Robinson from Fish Tank Bank, mentions “The best way we’ve found to generate more word of mouth referrals is to keep in touch with our customers long after they’ve purchased from us”. His advice for a follow-up, “We’ll drop them a message a few months after they’ve purchased from us just to make sure they’re still happy with the product”. He also implies that a follow up is just great customer service, “We believe this is stellar customer service and it’s a big driver of word of mouth referrals”. Matt McGee of Cari McGee Real Estate Team explains how good word of mouth has been for their business. “This focus on word of mouth referrals has been really effective for us. More than 70 percent of our business this year has come from referrals and/or past clients. In real estate, the average agent gets less than 20 percent of his/her business from referrals”. He also explains how telling clients about his goals before, during, and after client, transactions plays into his method of increasing word of mouth. “When we start working with a new real estate client, we tell them that our goal is to wow them so that they’ll want to tell all their friends and family. And when the transaction is complete, we follow through and send the review request. When you have a complete beginning-to-end (and beyond) focus on reviews and referrals — a system with processes that work — you can really make word of mouth a huge part of your business”. Matt also mentions, “We don’t offer incentives or rewards in exchange for reviews, because then the review becomes an advertisement and the FCC would require it to be labeled as such”. Matt Erickson from National Positions explains that it’s crucial to provide ongoing nurturing. “Ongoing client nurturing, whether it is a current client or past clients. It’s imperative to remain that friendly resource whose door is always open. This ongoing approach helps us earn and/or retain trust, which increases the possibility for word of mouth referrals”. Even if you meet with a client only once, you can build a strong relationship with them. Steve Stoward, the owner of Mattress Cleaning Melbourne, explains that building a relationship in just one meeting is possible. Especially if your business dives deep into the lives of a client. “There are some particular niches in business that I think have a greater chance of success when it comes to word of mouth referrals”. Steve mentions that in his business it’s easy to create trust, “I find that the very intimate nature of my business lends itself to later conversations by my clients with perhaps close friends or other family members which in turn very often turns into extra business for me”. But the nature of his business and the trust it builds is what leads to his word of mouth. “When business is a little quiet I find myself talking with my clients for longer periods of time than normal. This usually leads to a stronger trust factor between the client and I which in turn increases my word of mouth referrals”. Freelance writer Elise Dopson, says relationship building is key. She explains, “ Make relationships with everyone—even if they’re not your client. I’ve made friends with other freelancers through Twitter, and even created a private Slack network for freelancers, where we pass work on if we’re unable to take it on for whatever reason (not a good fit for their business, too busy, etc)”. She mentions that word of mouth can lead you to your best clients. Elise adds, “I actually landed one of my highest-paying clients through a referral from another freelancer, and because those strong relationships have trust in them, it’s much easier for me to refer a person I’m confident will do a great job, and vice-versa”. “User-Generated Content (UGC) is the most effective way to increase word of mouth referrals”. Says Ryne Higgins, of Peacock Alley. Ryne goes on to explain that “UGC builds trust and develops a sense of community among customers and potential buyers because it comes from their friends and family”. The best way to get UGC is via social media. “Social media is simply the best platform for UGC because you can easily encourage users to share pictures and videos of your products and they can express their opinions to their followers. Not only will this save you time and money on content creation, but it opens the doors for many other possibilities”. If you’re wondering what some easy UGC is, Ryne says “Contests, special hashtags, and reviews are all forms of UGC that will dramatically increase word of mouth referrals”. House Hero’s, Earl White explains how networking is huge for word of mouth. “Our company’s most effective method of receiving word of mouth referrals is networking at industry events”. He explains that “After conversing with others regarding our service and making a positive impression, our new connection naturally recommends our service to prospective leads”. Gina Hutchings of WSA agrees, “Networking works well. Ask your clients to bring a fellow business or contact to an event. They get a nice treat and feel valued while you network with a contact that is already warm and open to meeting your business’. The Jacket Maker’s, Gath D’Silva mentions, “Word of mouth referrals can be grown through product reviews, partnerships, influencer marketing, even refer a friend. Anything that highlights a past customer experience or one that is shared through a first time customer, a friend of a customer etc”. Kenneth Burke, from Text Request, agrees. He says, “As a B2B software, it’s working with businesses who work with other businesses. For instance, working with marketing agencies is a good fit. They can use our services, and then recommend (or pay for) our services for their clients as there’s a need”. Hamna Amjad from Ridester explains why offering something unique is key to getting customers to talk. “I think the most effective way to get more word of mouth referrals is by offering a unique and memorable experience for customers that compels them to share it loud with everyone”. Put a spin on something that’s already out there, if you make it your own you might encourage people to talk. Hamna also says, “When you give your customers something different that they don’t get anywhere else, they will not only be impressed but also share it with their family and friends. In my opinion, this is the most genuine and organic way to acquire leads”. Uncorked Adventures, Mark Aselstine gives customers a little extra treat. He mentions, “I write fairly extensive newsletters, which go in the box along with people’s wine club shipments. At the bottom of those newsletters, there is a small section where I offer some free wine in exchange for a referral”. He mentions this little gesture leads to great success. Saying “Not surprisingly, people seem to be happy to claim that prize! It also gives me some idea about how people are consuming the wine that they receive”. By making a simple addition to shipments, he says “it’s clear that the newsletters get passed around, along with the wine, often at dinner parties between good friends”. Marketer at El Mejor Trato, Sophie Miles says it’s important to refine your message to help with your branding position. She says, “Your brand positioning is one of the most important assets in your business”. She mentions that this is because this is how your customers see you and your value. “But also, it refers to how your consumers can sell your idea to their family and friends when making recommendations”, she added. Sophie brings up a technique called “good-fast-cheap” pyramid. She says, “In short, this technique understands that your brand can only focus on two of these three qualities. That is, your product can be good and fast, good and cheap or fast and cheap, but not all three at once”. Just like you, as a coffee drinker, you know perfectly the advantages of each of these options, your customers must know perfectly what your advantages are and what separates you from the rest”. Her point, “Make sure that your clients know perfectly what is what differentiates you from your competitors so that they are able to recommend you effectively”. Alayna Pehrson from Best Company explains, “An effective way to get more word of mouth referrals is through social media”. She goes on to say, “Once you are able to build up that social media following, use those platforms to promote your content/blog and nurture your follower relationships for potential leads”. Alayna provides a great example of how to do this too. She says, “For instance, if you tag a few followers in a video on Facebook, they will be more likely to either share that video or tell their networks about it”. We wrote an article on how effective does social media drive word of mouth to learn more. Similarly, Thera Specs’, Greg Bullock mentions how influencer marketing is great for developing credibility and leads to qualified customers. He states, “This can be especially effective for health-related products, where the communication of real experiences among patients is highly valuable in the fight against misinformation and sham “treatments” that frequently make the rounds online”. Sometimes you gain word of mouth simply because you’re the answer to a problem. Doug Mitchell from Ogletree Financial says it best, “I focus on solving my client’s problems. I have found that putting clients first will often get them talking to friends and family about the job I am doing for them”. Howtomakemyblog owner, Marko Saric, says it well, “Create great value to the people you are targeting. If you answer questions real people have and if you solve their problems better than others can, you stand a good chance of them being very happy with your product and/or service and telling their friends and others in their network about you”. It’s simple, a reward can be a driving factor. “A customer referral program where they have an incentive to refer a friend has worked best in my experience, as they have an incentive to tell their friends”, says Steph Taylor a wellness entrepreneur. Marina Loucas, from Your Parking Space, agrees that a reward can be a huge driving factor in building word of mouth. She explains what has been most effective for them is, “Offering something to a customer, for example, a discount on their next purchase or booking, if they refer their friends to your website”. Arkon Game’s Casey Hill explains, “The best way to get word of mouth referrals definitely is NOT by asking your customers to refer you”. He suggests, “Instead, try to always go above and beyond. Deliver a little something extra when they make a purchase and you will be amazed by the dividends that pay for long-term word of mouth sales growth. Always seek to make a first experience exceptional and you will create brand advocates”. “Making the process as simple as possible. One click, that’s all it should take”, says Bart Turczynski of Zety. He does mention that you should hone in your focus. Bart says, “However, you should only focus on users who are really excited about your product. Otherwise, your efforts will be futile and might come across as spammy”. Another way to make the process easy is to provide customers with good information to share from the get-go. Allen Michael from Home Viable mentions, “Give your customers a reason to talk about you”. This gives your customers a quick excuse to bring you up. Allen says, “Without an ‘excuse’, your customer will have a much harder time finding ways to refer you. But, by providing stories, specials, messaging, and motivation, it makes it a lot easier for a customer to talk about you in their spheres”. Marketing solutions provider, Tabitha Naylor mentions you just have to do a little bit of work to get it going. She mentioned, “The reason so many people fail to get good word-of-mouth referrals is that they don’t take enough action to encourage the referral process”. Her first piece of advice is to ask for a referral. She says, “The first step is to make sure you’re actually asking for them – never assume that people will make referrals just because they’re happy customers”. To strengthen the ask, you can incorporate an incentive. “When you’re asking for the referrals, you’ll want to make it clear that there’s a time-sensitive incentive for them if they follow through, whether it be a discount or a free gift. Making the incentive time-sensitive is important because it encourages people to act immediately – if it isn’t time sensitive, there’s a good chance they’ll forget about it altogether”, she says. Her final piece of advice for getting word of mouth is to make it simple for customers to do. “You’ll also want to make sure it’s easy for the customer to make the referral – if they need to go out of their way and figure out complex steps on their own, they probably won’t bother following through” Tabitha explains. Dayne Shuda from Ghost Blog Writers, mentions “The #1 way has been to make our current customers happy”. He follows up by saying, “After that, I would say a referral program, which we’re working on implementing or 2019. We’re testing a program right now and the early indication is that it’s popular. We tried to set it up as a win-win-win for the referrer, the new client, and for us”. Jx Tan of Momentum, says “Apart from referrals from a business’ existing clients, word-of-mouth marketing also includes lesser-known tactics such as forging complementary partnerships”. He explains that they receive inbound inquiries from potential business partners from the blogs they write as well. How does that relate to word of mouth? Jx explains, “In terms of effectively engaging these partners, I take the CEQ approach (Complementary partnerships, Example-driven communications, and Quick-wins)”. With this, he says the first step is vital. “Firstly, I seek information to assess whether a potential partner is a complementary fit and communicate in an example-driven manner to address their area of interest. If there’s a good fit, I will list down some quick-wins for a potential partner to consider so that we can start working with their existing clients”. Carla Williams Johnson your friendly neighborhood marketer, talks about how good word of mouth marketing is, “Word of mouth is by far the easiest form of organic advertising and literally costs zero dollars”. She even mentions “Always ask for referrals from persons you have worked with, even if it was for free, and offer some sort of referral incentive such as a discount off their next purchase just to encourage them to spread the word”. Carla brings up a fantastic point, however, “Also bear in mind that word of mouth travels both ways. If someone was unhappy with a product or service provided, then we can only imagine what they will be telling others, so try as much as possible to provide exceptional, quality service to so to make it easier for persons to refer you with a smile on their face”. Though we talk about word of mouth as a great way to get your business out there, it can also play a role in the opposite effect. Tracking word of mouth can be difficult, but getting it doesn’t have to be hard. As Jimmy Chan from Pixelicious mentions it can be a big part of your business. Thus, it makes sense to do what you can to increase it. He says, “WOM has become so important as a sales funnel that it represents 50%+ of my sales. I am worth as much as my reputation and my clients get to dictate that”. Jimmy also discusses that word of mouth is a very trusted source.“Word of mouth is still king by far, people are skeptical of what they see in ads”. He goes on to explain how you can achieve great word of mouth, “Let your clients do the selling for you, focus on delivering the absolute best client experience possible. Once you have a small network of happy clients, the buzz will spread quickly”. But how do you get them to talk? Here are some good base tips to remember when planning for maximum word of mouth growth. Syed Farhan Raza, the growth hacking guy mentions these three tips as a must for increasing word of mouth. “Build a personal level relationship with the happy customer”. “Help out the influencers and opinion makers in your space. Their shout out is worth it”. “Target the lower tier people in the industry who are well connected (and not necessarily influencers)”. Sajan Devshi from Learndojo has found that word of mouth referrals are easier to convert to customers. “What we have found is that when a person is referred by someone they know, they are easier to convert into sales as it’s their friends or family making the recommendation rather than us and they instantly have faith and trust and there is no hard sales pitch required”. He mentions, “in short, word of mouth is still extremely effective and usually built on providing extreme value, so much so that people feel the need to tell others about it”. A lot of the tips and first-hand experience we heard backed up a lot of which we already knew. Word of mouth plays a huge role in the quality of referrals being sent in, and it can be a huge part of your overall leads. Along with running some sort of rewards program, customer service is a key factor in priming word of mouth to happen in the first place.